I ran across this item this morning. (Read the post.) Somehow, it rang a bell for me about ham radio - QRO, "radiosport", etc. It's interesting what the average deer hunter pays out each year. It puts radio into some perspective. 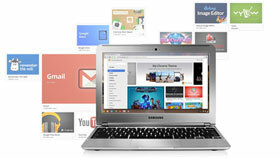 The Samsung Chromebook (previous post) is a fine little machine. Simple setup, simple operation. What could go wrong? Well, try to integrate it with your home network! You can't directly connect to anything, like your printers on the network. (There are SSH and FTP apps, but they seem to work through a proxy outside the local net.) Google wants you to use its Cloud Print service (beta! ), which allows you to print to a file in the cloud which is then queued for any cloud-connected print server for which you have permission. It's on you to create a cloud print server for your local printers if you want to print from the 'book. To do this, you must 1) log in to your PC (under your ID of course), 2) run the Chrome browser, 3) set up a server process, and 4) configure sharing with any Google IDs you want to have printing. Your local PC becomes a server (and it has to be turned on), and you have to be logged in. That adds $100 or so to the price of the Chromebook. Caveat emptor.